The PD-150 loop detector is an intelligent, extremely flexible and very affordable product. ThePD-150 is designed to accommodate numerous applications, can be adjusted intelligently to any environments and virtually eliminating false detection. On the front panel, the four selectable loop frequencies (20~80 KHz) can completely eliminate any crosstalk. If intermittency happens or failed loops get self-healed, the detector will resume normal operation without manually reset the detector. 1. To arm card readers and ticket dispensers. 2. As a barrier/gate/door closing detector. 3. 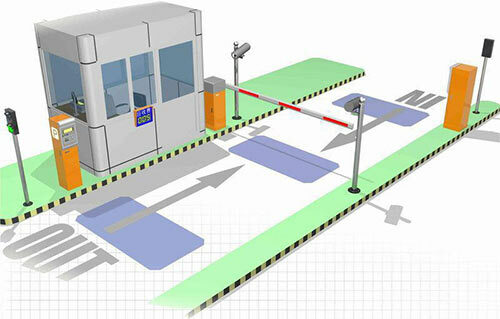 As a barrier/gate/door opening detector (Free exit). 4. To generate pulses for counting vehicles. should be giving to the loop sensitivity when installing on different surfaces. Setting the correct sensitivity allows the loop to operate with maximum detection. When detection occurs, the detector energizes 2 relays for the output (each can be configured individually). This energizing of the relay can be configured into different modes, by selecting the respective dip switch. The sensitivity of the loop can be adjusted by the trim pot labeled “Sensitivity”. The user can select 4 different setting by turning the trim pot with 0 being the least sensitive and “4” being the most sensitive. Loop detectors in recent years have become a popular tool having innumerable applications in policing, right from surveillance operations to traffic control. Automation of gates and doors has become a popular usage of the loop detector. The PD-150 vehicle loop detector is compatible with most gate operators. The PD-150 may be used in Center, Safety and Exit loop positions.Fifteen sensitivity settings allow for fine adjustment of the detection level. How to install the loop detector?